Amulets and Jewelry for health, protection, success and many more, based on the world of the Kaballah. While the placing of a mezuzah on one's doorpost is a Divine commandment that is to remind us that G-d is in charge of everything, this Mezzuzah holder takes it one step further and invokes the various names of G-d and His Angels on the Mezuzah cover itself. The Divine name of G-d is on this 24k gold plated Mezzuzah as well as His Holy entourage of Angels which in the form that they are written here are in charge of the blessings on wealth! The bottom section on this gold plate is the famous 4 rivers coming out of Eden which bring blessings of all kinds into this world. 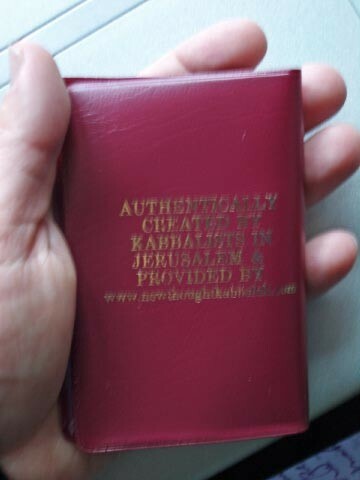 This is a brand new idea, and it has not spread too far overseas so this is one of the few places where to get this unique Mezzuzah holder. (Mezzuzah sold separately). DIMENSIONS: Entire wooden cherry tone case is 4 3/4 inches. The cavity to put the Mezzuzat is 4 1/4 inches = 13cm. Brand new. 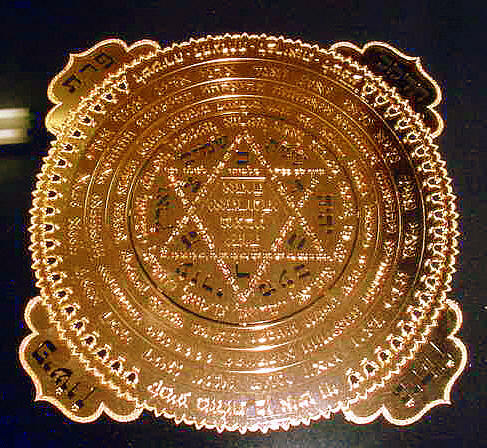 This beautifully produced 24 Kt Gold plated kabbalah amulet/Mezzuzah contains the various Names of G-d and G-d's messengers, the Angels. The house and people are assured that the Angels shall watch over him/her to be successful in life. The size of this amulet/Mezzuzah is a little over 4 3/4 inches in diameter. 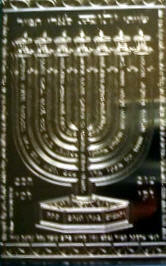 The famous Ana Bekoach Psalm is written on the menorah. For centuries this Psalm has been used by Kabbalists to connect to the Tree of Life. King David meditated on the Menorah with the Ana Bekoach before going to battle. He would rise at Midnight and spend the morning meditating on the Menorah and the Ana Bekoach. Once purified and ensured of success he would then proceed. 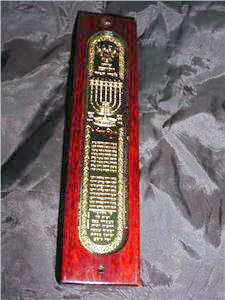 The Kabbalistic amulets are 24 Karat Gold plated and measures a little over 1 1/2 x 1 1/2 inches ). Each amulet is made from metal and plated over the metal. The amulet is laminated so it will not get ruined by daily wear & tear and comes with its own plastic wallet. 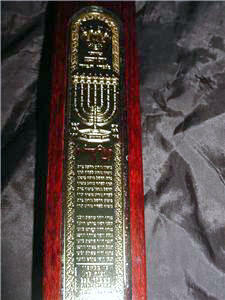 Made by Kabbalists in Israel where each amulet is prayed over and the appropriate Kabbalistic words are adhered. Slightly larger than the other amulets. See our special wall amulets. Revised: 11 Aug 2015 15:51:28 -0400 .